New athlete Jim's effort is something to see and already paying dividends. Welcome to the Silverback Nation Jim, keep it up! Cheers- not like a toast but like the bar, where every one knows your name. I was trying to explain to my MIL why I get up at 4AM to go exercise and when I was finished she said, “So, it’s like Cheers, I get that.” Jim reiterated this point this morning. He said, I come because when I miss I feel like I’m letting people down. Really, have you ever heard anyone at a “regular gym” say something like that? I was a member of a small gym for 2 years and the owner re-introduced himself to me a dozen times- he didn’t know my name and didn’t care if I showed up as long as he debited my account each month. I look forward to seeing you guys every morning. I am thankful that you push me to be better. I love this “gym”. Thanks for caring about us Matt, the programming is stellar. Off my soapbox now……. 6:5? today, LOVED this workout, maybe should have gone 10lb heavier but it was fun to move through this so fast…………..see ya Friday! I can’t make it either; take an evening off Matt! Today’ s effort was excellent, I threw some new moves at you and no one even flinched. In fact you all’s enthusiasm to tackle a new skill progression and push yourselves challenges me to push you further. A great day to be a coach, thanks guys. Liked the ring row planks; enjoyed the new HSPU progression work. The wod, however, took its toll. I should know better when Casey “loves the workout”. I’m still a newbie; I’ll learn. Matt – thanks for your work with Jessica. You’ll be pleased to know that she had a hard time feeding herself dinner tonight. Linda – great effort, especially on those last front squats. You didn’t compromise an inch. That’s a part of the nutrition program we find most effective for calorie restriction. Jessica, you did great, keep it up and you will be shocked how far you can go in a month. Brad, You don’t know how much your comment lifted my spirit. Tim says that Matt has a saying “Sometimes you are the windshield, sometimes you are the bug”. Tonight I was the bug. I couldn’t get out a single pushup, and the push presses were just eating my lunch. 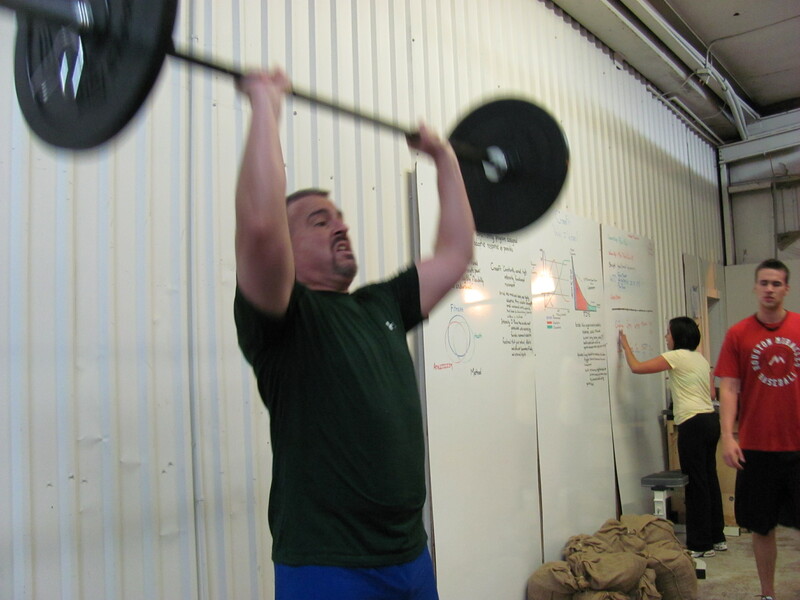 I started out on 45# on push press (lowered to 10#DB) and 45# on front squat. Finshed with a time of 14:35. Brad, great work on the pike with one leg in the air. Jessica, Way to go! Matt explained a lot to you and you did great. Linda performed an AMAZING WOD tonight, its my job to present all of you with opportunities to succeed, tonight I got the scaling wrong and unintentionally stacked the deck against her, but her effort or ability was never in doubt, every rep was textbook and we could all see how deep she was digging. Their ain’t an ounce of quit in her. Linda just know how excited I am of how far you have come in 8 weeks and if you ever let up I’ll be on you like a rash. Enjoy your off day.